And having found Him, thou did receive rebirth by baptism. He grant our souls the forgiveness of our sins. From a peasant family, she was chosen as a wife by The Grand Duke of Kiev, Igor. When he died in 945, she became her son's guardian and ruled in his name. She traveled to Constantinople where she accepted Christianity and was baptized by Patriarch Polyeuktos, taking on the baptismal name of Eleni as given to her by Emperor Constantine VII. She returned home to Russia with groups of clergy who proceeded to baptize those Russians who accepted Christ. She worked tirelessly to establish Christianity in Russia. She financed the building of great numbers of Churches and helped establish seminaries and other schools to educate future priests and teach catechism to the people. St. Olga lived a life of piety according to her Christian beliefs, and many of the Russian courtiers followed her example. The Church honors her missionary efforts and pious life on July 24. 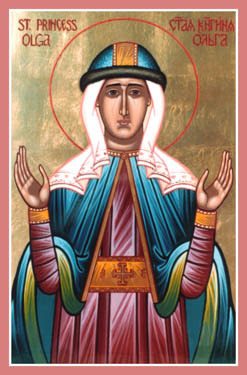 The sisterhood of the parish was reorganized in 1988 (replacing St. Nicholas Ladies Sodiality) and adopted the name of "Sisterhood of St. Olga" in remembrance of St. Olga, Princess of Kiev and Equal to the Apostles, on the occasion of the celebration of the Millennium of Russian Orthodoxy. St. Olga was a pious Christian princess and was instrumental in the conversion of her grandson, Prince Vladimir, who was baptized, along with thousands of Russians in 988 A.D. Thus sprang forth the spread of Orthodoxy into all of Russia. The Sisterhood was organized to administer to the Parish as needed. A Russian/Slavic Food Festival has been held the first weekend in November each year since the early 1980s. Ethnic baked goods are prepared as well as hundreds of plate lunches. The Sisterhood offers for sale imported items, both religious and secular, in the Beriozka store which is maintained throughout the year.Costumes were imported to be worn at the festival. The funds raised by the Sisterhood are used for parish improvements and acts of charity. Also, the ladies provide refreshments each Sunday for the coffee hour before Sunday School and agape meals after all-night services at Holy Nativity (Christmas) and Pascha (Easter); and special meals are prepared for visiting clergy. Through the efforts of the Sisterhood, support is given to the clergy and the parish, by bringing in needed funds, doing charitable works, and other talents distinctive to womanhood. What a magnificent way to use their talents for the Glory of God! St. Olga pray for us!